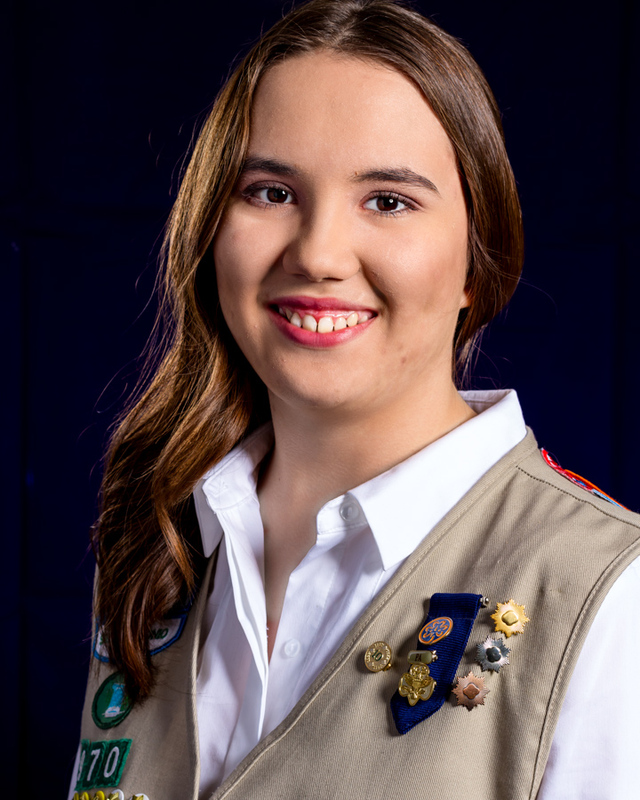 Ever since Becky was diagnosed with Stickler Syndrome, a disease that has slowly taken away her hearing and eyesight, Girl Scouting has been right there with her. In fact, it was Becky’s enthusiasm to attend Girl Scout camp in kindergarten which led to a physical exam that alerted doctors to her condition. At first, doctors insisted that she attend a school for the deaf, but her parents refused to remove her from Westside Christian, a private school, where she was attending. 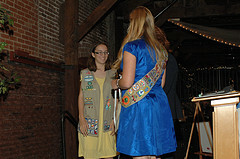 Becky receiving her Silver Award in the Spring of 2011. “We didn’t think there was ever any reason for her to leave her friends and school. She was doing just fine in kindergarten, so what was going to change that? We never had any doubt in her abilities,” said Wendy Sieruga, Becky’s mom. Fully aware of her condition, Becky quickly began to learn American Sign Language (ASL) and prepare for a life that might one day place her in the blind and deaf community. Her Gold Award mission: to educate the public and increase awareness about better communicating with deaf individuals. “As I learned ASL and got more involved in the deaf community, I realized that there is a lack of knowledge and understanding by outsiders of the hardships faced by the deaf,” said Becky. 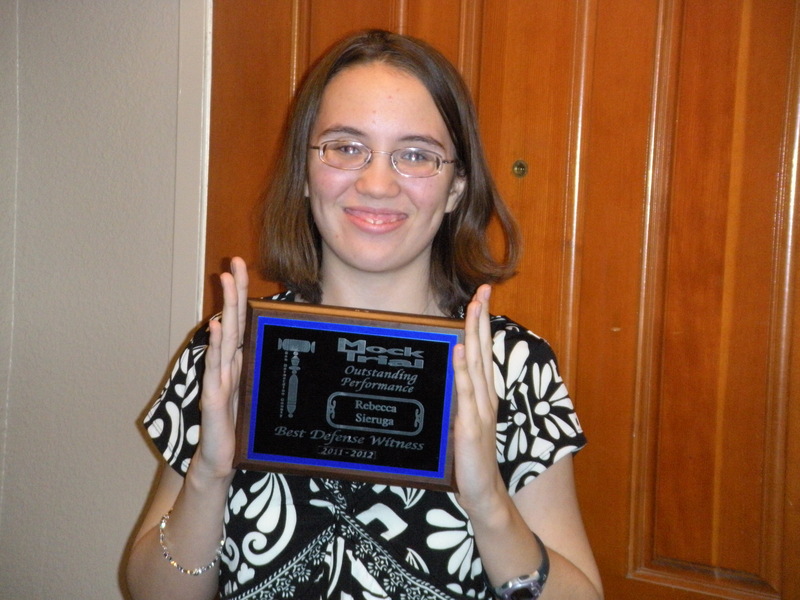 A member of Arrowhead Christian Academy’s mock trial team for 3 years! This is what prompted her to focus educating the public and increasing awareness about ASL communication for her Gold Award. Over the course of a year, and more than 100 hours of work, Becky completed her Gold Award. Her project – What Do You Hear?– is very dear to her heart and involved Becky personally teaching an ASL class at her former elementary, Westside Christian School. She also made sure to educate the younger girls in her troop and translated two books into sign language videos before sharing them with the public online. Younger girls from her troop earning their Bronze Awards, Becky (behind) coaches them in ASL. Despite mounting challenges from her genetic condition, Becky has continued to thrive. She attributes her success to three pillars of strength: her faith, her parents and Girl Scouting. And how does she feel about her parent’s decision to leave her in Westside Christian, instead of attending a deaf school? 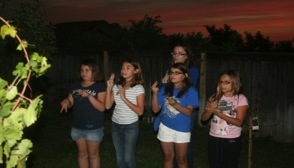 Becky (center) teaching ASL to Kassidy Burdette (left) and Sarah McClung (right) two girls from her Girl Scout troop. Becky is a straight-A honors student who serves on her school’s mock trial team. She is a member of Girl Scout Troop 970 and on the Spiritual Life/Worship Team at Arrowhead Christian Academy. She has now completed her Bronze, Silver and Gold Awards and continues to be on a leadership team for younger Girl Scouts. She dreams of attending Duke University, where there is a prominent deaf community, after high school and continuing her studies. Becky loves science and would plans to go into forensics studies. The Girl Scouts of San Gorgonio is proud to call Becky a member of the family, a young woman of true courage, confidence and character who has already begun to make the world a better place. Previous Previous post: Girl Scout Troop 414 and Troop 103 honor first baby girl born on Juliette Low’s birthday!